John Hart's New York Times bestselling debut, The King of Lies, announced the arrival of a major talent. With Down River, he surpassed his earlier success, transcending the barrier between thriller and literature and winning the 2008 Edgar Award for best novel. 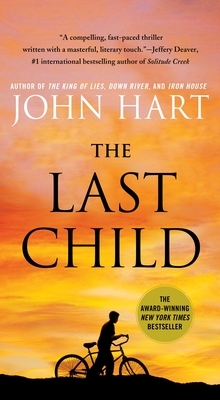 Now, with The Last Child, he achieves his most significant work to date, an intricate, powerful story of loss, hope, and courage in the face of evil. Thirteen year-old Johnny Merrimon had the perfect life: a warm home and loving parents; a twin sister, Alyssa, with whom he shared an irreplaceable bond. He knew nothing of loss, until the day Alyssa vanished from the side of a lonely street. Now, a year later, Johnny finds himself isolated and alone, failed by the people he'd been taught since birth to trust. No one else believes that Alyssa is still alive, but Johnny is certain that she is---confident in a way that he can never fully explain.